The system is controlled via a DigiCo SD11i with Stealth Core 2, using this console give the flexibility to insert Parametric or Dynamic equalisation on any input or output. The main control area is based in the OB compound making communication with the broadcast team very simple. PA control is home to 18 x Toa VP series amplifiers feeding 15 zones. 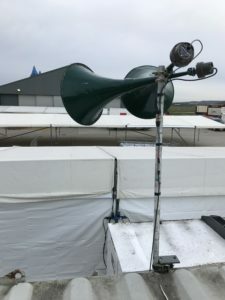 Wether the zone is a grandstand, section of crowd line or a hospitably area with just a press of a button the volume or eq can be adjusted accordingly. From PA control the signal is sent 100v 2 ways to secondary control areas, each of these areas boasts another 4 Toa VP series amplifier, monitor panel and distributor, the signal is then sent back to PA control to be monitored. 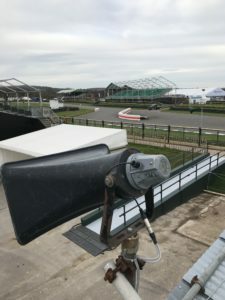 57 horns (Toa sc615m & Vitavox) to cover the paddock areas, this system is also zoned for complete control. 4 x PA systems in corporate areas for question and answer sessions. Emergency PA to Cover the ‘over the road area’ this is feed via radio link from PA control.